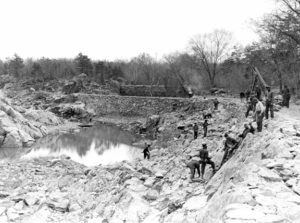 The C&O Canal Trust, in partnership with the C&O Canal National Historical Park is searching for stories from African American workers of the Civilian Conservation Corps (CCC) who worked along the C&O Canal from 1938-1942. Workers themselves or descendants of workers are encouraged to contact the Park to share memories from their time along the canal, for use in a new exhibit to be housed in Canal Quarters’ Lockhouse 10. The camps were located in Cabin John across Clara Barton Parkway from the U.S. Naval Research Laboratory, and at Carderock near where the picnic pavilion now stands. Because of privacy laws, Park staff is unable to obtain the CCC rolls from the National Archives and Records Administration and can only request information about specific workers with permission from the workers themselves or from their next of kin. The little-told stories of these New Deal workers are being brought to light thanks to money from the National Park Service’s Civil War to Civil Rights initiative, aimed at increasing the diversity of the Park’s stories. After collecting oral histories from African American CCC workers, staff will then develop and install interpretive materials into Lockhouse 10 in Cabin John, including historic photos and audio/visual elements. The hope is to also develop a mobile app with an augmented reality component, which would allow visitors to learn more about this time period in history. Lockhouse 10 is a part of the C&O Canal Trust’s award-winning Canal Quarters program (www.CanalQuarters.org), which includes six historic lockhouses, rehabilitated and available to the public for overnight stays. Lockhouse 10 depicts the New Deal time period and is furnished with 1930s décor, including several authentic pieces with CCC provenance. The interpretation in this lockhouse will be enhanced by the stories uncovered through this new initiative. The canal benefitted from CCC crews due to good timing – the land had just been acquired by the Federal Government in 1938, after the 1936 flood had decimated the already-damaged canal and surrounding communities. The New Deal was swinging into action, and the canal had shovel-ready projects ready to go. Their work included clearing silt from the canal and restoring the towpath from Georgetown to mile marker 22 at Seneca, expending nearly 160,000 hours of work on canal projects. Several events will be held in summer 2017 where Park staff will share the stories they have uncovered with the public. This project will culminate with a scholarly paper that will hopefully serve as the impetus for future research on African American history along the canal. If you were a CCC worker along the canal, or know someone who was, please contact Whitman at [email protected] or 301-745-8888.